Tired of standing around, feeding your paper shredder until it decides to jam on you? How you shred is about to change! Previously known as 100X, the new 130X Stack-and-Shred automatic shredder from Swingline, lets you load and shred up to 130 sheets automatically. Just stack, shut and continue with your important work. Perfect for home and small office, executive or personal shredding needs; the Swingline Stack-and-Shred 130X Automatic Shredder will cross-cut shred your critical documents with a manual bypass for up to 6 sheets. The 130X also provides essential automatic jam clearance, making this unit an attractive item when considering a paper shredder. Swingline is new to the document shredder market, however will soon be known for manufacturing high quality shredders that can help protect your identity and comply with privacy laws. Swingline offers a generous 2-year warranty on machines and 7-year on cutters. 7-gallon pull-out waste bin with bin full indicator. Runs consecutively for 10 minutes on with 30 minutes off to ensure longevity of the motor. Intelligent Auto+ Jam Clearance reverses and re-feeds stuck papers. 2 year warranty on machine, 7 year warranty on cutters. 17.5"L x 12"W x 16.25"H.
This is the best shredder I have ever used! For your home or office this shredder is perfect! I got this shredder last year. The functions are simple and easy to use. I would recommend it to anyone. Easy to use, alot of storage for end results! User friendly and so far has held up well! Love the hands off experience. Welcome to MyBinding video. Let’s take a look at Swingline’s Stack and Shred, an automatic shredder. Swingline has created a shredder where you don’t have to stand around and watch things shred. Turn the machine on, lift up the lid from the front, and stack your papers up to 100 sheets right in the top. Close the lid and automatically Swingline Stack and Shred will shred all of your documents one at a time. And when you have just a few sheets to shred, up to six of them can go right here in the manual bypass tray at the top. There’s a separate slot for credit cards. Stack and Shred can handle staples, paper clips, credit cards, and all kinds of papers. In case of a jam, simply hit the reverse button and remove your papers to start again. And all of the high level three cross cut shreds fall into a seven-gallon waste bin below. And that’s it. That’s the Stack and Shred automatic shredder by Swingline. For more demos, reviews, and how to’s of this product and many more, check out MyBinding.com. Transcript: Speaker 1: Thank you for taking the time to view the 100X training video. I’m Steve Frei, and this is the shredder that started all when it comes to Stack-and-Shred. Called the EX107 last year, it’s being renamed the 100X for 2012. So let me turn it on right here in the back while you take a look at the video. Speaker 1: Thank you for taking the time to view the 100X training video. I’m Steve Frei, and this is the shredder that started all when it comes to Stack-and-Shred. Called the EX107 last year, it’s being renamed the 100X for 2012. So let me turn it on right here in the back while you take a look at the video. Speaker 2: Any shredder prevents identity theft; only one prevents productivity theft – the Stack-and-Shred automatic shredder from Swingline. 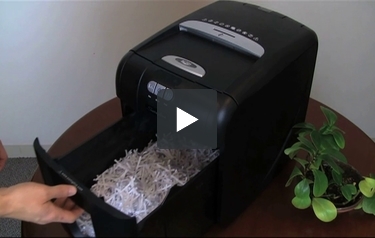 This innovative machine lets you shred up to 100 pages automatically. Just stack, shut and get on with your day. The new Stack-and-Shred offers a wealth of features, including large capacity pull-out bin, secure cross-cut shredding, automatic jam clearance, space-saving design, a manual bypass for traditional shredding, easily handle paper clips and staples and has a separate credit card slot. 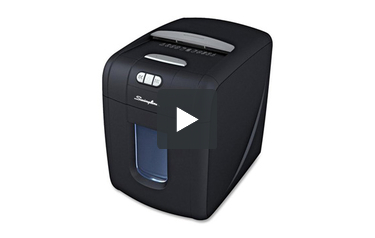 The new Stack-and-Shred automatic shredder from Swingline. Speaker 1: Thank you for viewing our training video on the 100X. Remember, there are four more videos on the other Stack-and-Shred models if you haven’t already looked at those. So please do if you haven’t. And I hope you enjoyed the video and realize now from seeing it why this has risen to be the number one selling commercial shredder in all of America in half a year’s time. Appreciate it. Thank you for your time. The 100X is a cross-cut device with a Level 3 security rating. It offers just enough security that you'll be able to shred various types of documents without worrying about your personal or professional information being stolen. This machine's big attraction is its shredding capacity. It's capable of shredding up to 100 letter-sized sheets at once. All you need to do is stick your stack of paper in the shredder, close the lid, and your documents will be shredded. This great feature will allow you to get your shredding done in a hurry so you can do something else. If you prefer to shred manually, the device can accept up to 6 sheets at a time. Due to the 100X's shredding capacity, it can be used in a lot of different places including the home, the office, and so on. There are few shredders that are as versatile as this one. You probably won't need to deal with paper jams very often because the 100X has the ability to clear up jams on its own. This is an excellent feature and it will help you get things done faster. When you're done shredding, this device will shut off automatically. This helps reduce power consumption while also preventing the motor from overheating. Also, the blades are self-cleaning so they'll stay nice and sharp. The 100X operates quietly so you can use it in a shared office. The waste bin will hold up to 7 gallons of shreds and it slides out for easy emptying. There's a window in the bin so you can see if it's full or not. Since this a Swingline product, you can expect to be able to use it for years to come. It's really durable and it comes with great warranty protection. The cutters are covered for 5 years and everything else is covered for 2. The biggest disappointment about this machine is that it can't shred CD's. You should choose a different shredder if you need a safe way to dispose of CD's. However, it can handle credit cards and document fasteners. There's even a separate feed opening for the cards. The 100X is a bit larger than a typical paper shredder. It measures 17" (height) x 12" (width) x 17" (depth) so you might have trouble placing it in a narrow space. The Swingline 100X is a standout in the company's new line of paper shredders. It's great that this device has such a high shredding capacity and that you can stick all of the sheets in it at once. There are a lot of other terrific features including the device's ability to automatically shut off and its durable construction. The only thing that might be a problem is the shredder's inability to destroy CD's. If that doesn't bother you, you'll find that the 100X is one impressive shredder. Check it out today. Is it possible for the Stack-and-Shred to accommodate legal size documents, too? Thank you. Thank you for your question. The Swingline Stack-and-Shred 100X Automatic Shredder is able to process legal sized paper. Thank you for your question. You are correct, this item is actually 28lbs. The cutter is going to be metal construction. To take advantage of the 15% give us a call at 1-800-944-4573 and we would be happy to place your order with the coupon. The shredder stopped shredding through the Auto feed. The manual feel works fine. What to do to fix? Hello, to begin, please turn off the power to the shredder and unplug the machine from the wall. Open the auto feed lid and clean the area per the guidelines from the user manual. Inspect the rollers and the sensors to ensure they are free of any debris. The sensors can be cleaned with a cotton swab. Once complete, close the lid, plug the unit back in, and try auto feed again. Does it take lubricator sheets or oil put into the blade area? Stack-and-Shred Auto Feed Shredders do not need to be lubricated. Adding shredder oil can cause difficulties with the auto feed function. How about papers that are stapled(30 or 50 pages)?Would it work automatically or do I need to remove the staples? Thanks for your email regarding the Stack-and-Shred 100X. You do not need to remove the staples before inserting your papers into the shredder. The machine will shred documents, paper clips and staples. Junk mail can be flattened out and shredded during automatic shredding, or fed through the manual feed slot.